The prophet Jeremiah was born into the priestly caste. That he would a priest was a given. On the other hand, nothing about his birth suggested God would call him to be a prophet. Yet, that would be his calling. When the moment came for him to receive his prophetic calling, like other prophets, Jeremiah asks of God “Who? Me? Are you sure you got the right person?” That’s a bit of a paraphrase, but I think it captures Jeremiah’s initial response. He had no problem with the priestly calling, he was born to it. But the prophetic one was very different. It wasn’t something he expected, and if we read this literally, he was rather young when the call came. I’m not given to theologies that assume God predestines our lives in unchangeable ways, though I do believe the Spirit gifts us for ministry, perhaps from the womb. I do believe that even prophets, like Jeremiah, have the freedom to say no to God. On the other hand, it’s not easy saying no to God, especially when God says to you, this is what I created you for. In the end, Jeremiah says yes to the call, though as is revealed in the book of Jeremiah his message didn’t make him popular with the governing authorities or the people. His counsel challenged the arrogance of the leadership. Indeed, just a few verses following this statement of call, the word of the Lord came to him, and he declared that “out of the north disaster shall break out on all the inhabitants of the land.” God tells Jeremiah that the people will fight against him, but they will not prevail (Jeremiah 1:14-19). As we continue the journey through Epiphany, reflecting on the ways in which God is made manifest in the world, shedding light into darkness, it is appropriate to take notice of a prophetic call. According to what we read here Jeremiah the call came to Jeremiah when he was only a child. He would be called upon to speak words of judgment on his own people, though he would also offer them words of hope. While called to speak to own nation, his ministry would have a wider berth. He would speak to the nations as well as Judah. His calling comes at a time when reform was underway in the land of Judah. This was the time of Josiah’s reign. Josiah was one of the righteous kings of Judah. They were few in number, but they arose from time to time. Things were looking up, at least for a while (2 Kings 23:1-27). Unfortunately for Judah, Josiah died in battle, fighting against Pharaoh Neco of Egypt (2 Kings 23:28-30). Things went from bad to worse after Josiah died. His son, Jehoahaz succeeded him, and as is often declared in these books of the Kings, the new king “did evil in the sight of the Lord, just as his ancestors had done” (2 Kings 23:32). From there one son of Josiah took the throne until Nebuchadnezzar stepped in, leading to captivity. The time frame for Jeremiah’s ministry is noted in the opening frame (verses 1-3), which tells us the Word of the Lord came to the prophet in the thirteenth year of the reign of Josiah (627 BCE) and would continue until the time of the exile that took place when Zedekiah was king (587 BCE). Jeremiah didn’t accompany the exiles to Babylon. Instead he was taken to Egypt, where we assume he died. Taking just the text before us, what we have is a word concerning prophetic (and perhaps ministerial) callings. In light of the season of Epiphany, this calling would be a manifestation of God’s presence. Jeremiah is called and consecrated to this ministry from his conception—when God formed him in the womb. We often take note of the word concerning God forming Jeremiah and knowing him before birth, while neglecting the reference to his consecration. Prophets generally were not consecrated. They were called and empowered, but consecration was something that applied to priests (and kings). It has to do with anointing, and in Israel’s case heredity. Jeremiah didn’t choose to be a priest, he was born a priest. Apparently, he descended from the line that goes back to Abiathar, David’s priest, and from Abiathar back to Eli, mentor to Samuel who consecrated David as king. That Jeremiah comes from the town of Anathoth is important for understanding his prophetic ministry, which takes a rather anti-monarchical position. This is perhaps due in part to the fact that his priestly line was itself in exile. Abiathar, who had been priest during David’s reign was sent away by Solomon, who backed Zadok (who unlike Abiathar had backed Solomon’s claim over that of Adonijah – see 1 Kings 2:26). Even if Jeremiah’s family didn’t serve in the Temple, we can expect that he understood what it meant to be a priest. He was born to that. His father would have informed him early on. He might have heard stories of Samuel, who as a boy apprenticed in the Temple during the priesthood of their ancestor Eli. He would have also been taught the story of his people, going back to the Exodus. He understood the covenant God made with Israel. That background would have informed his ability to speak for God in times of crisis. Having that background informed his prophetic calling, but the prophetic call is different than the priestly one. You’re not generally born to it. It requires a separate, unique call. A priest can be a prophet, but you needn’t be a priest to be a prophet. I wonder how that reality might be understood today. What might it mean to be prophetic in our context? Nevertheless, as we move forward, it would seem that Jeremiah operates not as a priest, but as a prophet. to build and to plant.” (Jer. 1:9-10). Jeremiah was appointed by God with authority over the nations. He will pluck up and pull down. He will destroy and overthrow. That is, he will pronounce God’s judgement on the nations. However, he will also build and plant. This is Jeremiah’s message, throughout the book, which is often universal in scope. Yes, he will speak to Judah—rather strongly—but the message is much broader than simply the fate of Judah. This gives us a reminder that the God who speaks to and through Jeremiah is not a parochial god. This God is not limited by borders. After all, Jeremiah will end up in Egypt, while much of Israel’s elite will find themselves living in Babylon. In a letter to the exiles in Babylon, probably written from Egypt, he encourages them to settle down and make a life there, praying for the communities in which they find themselves. After all, they’re going to be there for a while (Jeremiah 29:1ff). God may care a great deal about the covenant people, but God is also the God of the nations. God will deal with both as is appropriate. Jeremiah brings words of judgment, but also words of hope. After all there will be a new covenant, one written on the heart rather than stone (Jeremiah 31:31-34). It is this promise of a new covenant that Jesus takes up in his ministry. While Jeremiah likely has the aftermath of the exile in mind here, it found echoes in the ministry of Jesus, whose own calling is celebrated during this season of Epiphany. We see this calling of Jesus, one that spoke not only to Israel, but to the nations, in the visit of the Magi (Matt. 2:1-11) and in his baptism (Lk. 3:21-22). In the reading from the Gospel of Luke designated for this, the fourth Sunday after Epiphany, Jesus speaks of his own calling in terms of an anointing of the Spirit. While Jesus draws from Isaiah rather than Jeremiah, there is a similarity in their visions. 19 to proclaim the year of the Lord’s favor.” (Lk 4:18-19). And the Word of the Lord goes forth! 23 Thus says the Lord: Do not let the wise boast in their wisdom, do not let the mighty boast in their might, do not let the wealthy boast in their wealth; 24 but let those who boast boast in this, that they understand and know me, that I am the Lord; I act with steadfast love, justice, and righteousness in the earth, for in these things I delight, says the Lord. (Jer. 9:23-24). Picture attribution: Jeremiah, from Art in the Christian Tradition, a project of the Vanderbilt Divinity Library, Nashville, TN. 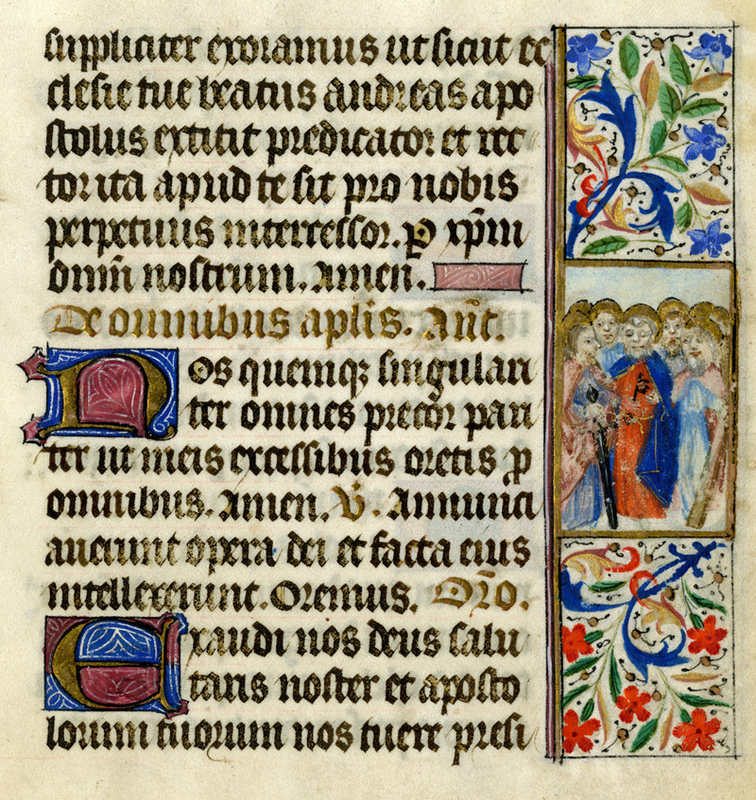 http://diglib.library.vanderbilt.edu/act-imagelink.pl?RC=55363 [retrieved January 28, 2019]. 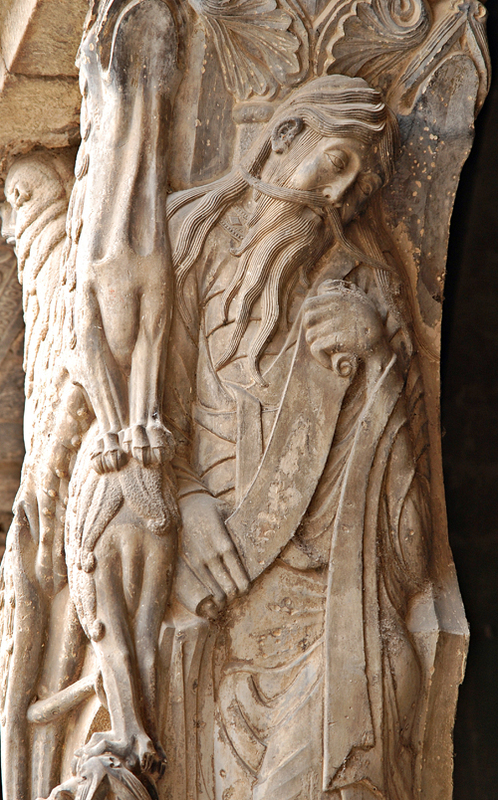 Original source: http://commons.wikimedia.org/wiki/File:Moissac,_Jeremiah.JPG. 8 1 all the people gathered together into the square before the Water Gate. They told the scribe Ezra to bring the book of the law of Moses, which the Lord had given to Israel. 2 Accordingly, the priest Ezra brought the law before the assembly, both men and women and all who could hear with understanding. This was on the first day of the seventh month. 3 He read from it facing the square before the Water Gate from early morning until midday, in the presence of the men and the women and those who could understand; and the ears of all the people were attentive to the book of the law. 4 The scribe Ezra stood on a wooden platform that had been made for the purpose; and beside him stood Mattithiah, Shema, Anaiah, Uriah, Hilkiah, and Maaseiah on his right hand; and Pedaiah, Mishael, Malchijah, Hashum, Hash-baddanah, Zechariah, and Meshullam on his left hand. 5 And Ezra opened the book in the sight of all the people, for he was standing above all the people; and when he opened it, all the people stood up. 6 Then Ezra blessed the Lord, the great God, and all the people answered, “Amen, Amen,” lifting up their hands. Then they bowed their heads and worshiped the Lord with their faces to the ground. 7 Also Jeshua, Bani, Sherebiah, Jamin, Akkub, Shabbethai, Hodiah, Maaseiah, Kelita, Azariah, Jozabad, Hanan, Pelaiah, the Levites, helped the people to understand the law, while the people remained in their places. 8 So they read from the book, from the law of God, with interpretation. They gave the sense, so that the people understood the reading. The Nineteenth Psalm declares: “The law of the Lord is perfect, reviving the soul” (Ps. 19:7). On the Third Sunday of Epiphany, the first reading from Scripture comes to us from the book of Nehemiah. Nehemiah describes life in post-exilic Jerusalem. Nehemiah was a child of those members of the Jewish community who chose not to return to Jerusalem after Cyrus ended the exile in the sixth century BCE. Now, years later, we lean that Nehemiah was serving as a cup-bearer in the court of Artaxerxes (r. 465-525). While in this capacity, he learned of the situation of Jews living in Jerusalem and Judah. Things were looking bad, and Nehemiah grieved over this situation. Then, he asked his patron if he could go to Jerusalem and address the difficulties facing the people (Nehemiah 1-2). In other words, he was asking permission to rebuild the city of Jerusalem, including restoring its walls and gates. The exile had ended nearly a century earlier. A Temple had already been rebuilt, but the city was still largely in ruins. Nehemiah believed he could do something about the situation, and he received permission from the king. In fact, he was sent home with the title of governor. The first reading for this third Sunday of Epiphany speaks of a ceremony in which the people gather to renew the covenant between the people and God. It occurs after the walls have been rebuilt. As the people gathered at the Water Gate, the people asked that Ezra, the priest, who according to the Book of Ezra had also received permission from Artaxerxes to return to Jerusalem (Ezra 7), read from the Book of the Law of Moses. So, the gathered people— “men and women and all who could hear with understanding”—listened intently as Ezra read from the “book of the law of Moses, which the Lord had given to Israel.” It is this law of the Lord that the Psalmist declares to be perfect. Therefore, on the first day of the seventh month, Ezra read from the book of the law. He began reading early in the morning and continued until midday. According to the story before us, “the ears of all the people were attentive to the book of the law.” For hours upon hours, the people listened attentively to the reading of the Word of the LORD. The lectionary leaves out verse 4, which includes a listing of all those who stood with Ezra as he read the Word of the LORD to the people. This group of people served as witnesses to the message. For continuity sake, I have included the omitted verses, but have italicized them. In verse 5 we have what looks like a repeat of what has already come to pass. Ezra is standing on the platform when he opens the book in front of the people. When he opens the Book of the Law, which is probably in the form of scrolls, everyone rises to their feet. There is a tradition in some churches to rise for the reading of Scripture. It is deemed to be a sign of respect and honor to the Word of God. I believe that at least some faith communities with this practice point to this event in the life of the people of Judah as precedent. This is again a reminder that what is taking place at the gate of the city is an act of worship, even as the people are engaged in renewing the covenant God had made with Moses. We’re told that when Ezra blessed the Lord, the people answered him by declaring “Amen, Amen” as they lifted their hands, bowed their heads, and worshipped God with their faces toward the ground. Yes, hearing the Word of the Lord read in community is an act of worship. It involved their voices and their bodies. As we hear this word, we might turn again to Psalm 19 where the Psalmist, declares that “the precepts of the Lord are right, rejoicing the heart” (Ps. 19:8). Following this section of the story we encounter an omitted verse. Verse 7 of Nehemiah 8, like verse 4, includes a list of names. For readers of the Scripture these omissions are likely helpful. However, this omitted verse provides important information. We’re told that this group of people assisted Ezra in explaining the meaning of the Law. This is a good reminder that Scripture is not always self-interpreting nor is it so clear that anyone using common sense can read and understand what is being said. No, this verse reminds us of the importance of teachers of Scripture. This is reinforced by verse 8, which tells us that this group of assistants “gave the sense, so that the people understood the reading.” We might want to use our imagination here to envision the assistants going out into the crowd and gathering smaller groups so that interpretation can be given. With this word, the section beginning in verse 5 comes to a close. The final section of the reading begins in verse 9. To this point, Ezra is the lead actor. He’s the own who reads the Law and offers initial instruction. Here in verse 9, Nehemiah, the governor, appears in the story for the first time. He joins Ezra and the Levites on the platform and adds his blessing to the event. Reading between the lines, it appears that as the people had begun to weep as the listened to the reading from the Law. Maybe they had begun to realize that they may have forgotten the core foundations of their faith. Now, perhaps for the first time, they are learning what the covenant entails. You might say that they felt convicted by the message. It’s at this point that Nehemiah stepped up and began to speak. He told the people: “This day is holy to the LORD your God, do not mourn or weep.” This is not a time for sack cloth and ashes. This isn’t Ash Wednesday. This is Easter Sunday! So instead of weeping and mourning, go home and celebrate. Eat the fat and drink sweet wine. Have a party. If you have more than enough for yourself, share with your neighbor who is lacking in resources so they too can celebrate. Nehemiah’s word to the people is a good reminder that holy days needn’t be somber. Some holy days might be somber—consider Ash Wednesday—but not all holy days require such an attitude. Some holy days require celebration. That is because “the joy of the LORD is your strength.” As we face difficult times—as did the people of Jerusalem living in the 5th century—may we find our joy in the LORD, who is our strength! Amen!